An encounter with the latest, and lost, Bond girl at the BAFTAs recently (I was testing Audi’s limousine service a tough job) crystallised exactly the sort of spy I would be. Instead of whirling her into the cloakroom in a maelstrom of witty badinage, I meekly opened a couple of doors and pointed her in the direction of the powder room, feeling suitably diminished as she wafted away with a polite smile. I’d be a timid agent, playing by M’s book and never having my 00 status rescinded, giving a nom de plume instead of my real name and never drinking or gambling on duty. It means I would drive Aston Martin’s new Virage. 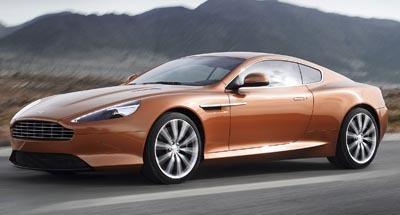 That is because the Virage is the calmer, cheaper, slower and less ostentatious version of 007’s DBS. All things are relative, with the deportment of Aston Martins, however: this Virage has a six-litre V12 engine, nearly 500bhp, and costs £150,000, which makes it still pretty potent. I believe this is the best-looking car money can buy. Other cars are pretty and might be more distinctive, but the Virage is witheringly striking in every sinuous sweep. It’s less butch and testosterone-fuelled than the DBS and sleeker and smoother, than the DB9. Even Bérénice Marlohe, the aforementioned vision, would be hard pressed to give it a game. Astons have historically had a habit of beguiling you initially, then disappointing with rather ropey construction: some hand-built cars in Britain evoke notions of sheds and Heath Robinson practices. No more. The factory where the Virage is assembled is eerily quiet and surgical, with black-suited workers flitting about fitting super-light metals and carbon fibre together. The result of this aerospace-style construction is a strong, stiff and considerably better-made car than previous-generation Astons, and the Virage has a beautifully appointed leather-lined cabin, too, feeling more bespoke now most of the buttons are not from Volvo. It’s not perfect. The entertainment/satnav system is the most maddeningly arcane abomination I’ve come across. Not possessing the skills of a Bletchley Park code-breaker, I found it near impossible to work out the buttons, screen instructions and behind-the-wheel rocker switches. There’s no Long Wave, and no option for a digital radio, which means it can’t receive Test Match Special or the Shipping Forecast, an omission in a British car that should see somebody sent to the Tower. I also started with the opinion the Virage could be louder. An indulgent poke of the accelerator doesn’t result in an operatic volley of exploding fuel, just usefully fast progress, and some ugly roar from the tyres. It was all a bit underwhelming-until I ended up on the B664, a sweeping back road between Uppingham and Market Harborough, Leicestershire, that zig-zags up, down and through the valley, an English Col de Vence, where the Virage proved a revelation. When pushed hard and changed manually, that V12 takes on a quite glorious timbre: harsh, metallic and searing. You expect Vaughan Williams, but you get Iron Maiden. It’s also agile, staggeringly quick with immensely powerful brakes, with a comfortable ride; it can be a grand tourer or dashing sports car. I reached Market Harborough and, having loved it so much, I turned round and went back for more. If only I’d been as decisive with Mlle Marlohe.